When I encounter people in the early stages of a break-up, one of the most common beliefs I come across is their assertion that they will never feel truly happy again. A broken heart can leave feelings of grief so deep that we literally cannot comprehend the possibility of future happiness. Positive thinking, changing your perspective and “seeing the bigger picture” are simply not an option in those early days. Telling someone whose partner left last week that “everything happens for a reason”, will not be received well. In time you will feel better, but who wants to wait? We want a guarantee that things will get better fast because this pain is unbearable. So, how do you get from here to there? Suppressing emotions is the surest way to hold onto them for longer; if you want to be free of your pain you are going to have to feel it. Missing someone who played a huge part in your life is entirely normal but grief is messy, inconvenient and sometimes frightening. Some people fear that if they start to let out the anger and pain it will never stop, others may feel (usually when judged by outsiders) that it’s wrong to get so distraught about the end of a relationship and that they should just “forget about it” and move on. Grief doesn’t always have to exhibit as a huge display of emotion (although if it does, that’s fine). It can be as simple as acknowledging how you feel, telling yourself it’s OK to feel that way and allowing the feeling to pass. Next time you feel a painful emotion around your break-up become aware of how it feels and see what happens. If it’s possible, try not to distract yourself from the feeling, or to change it to something more positive. Stay in the moment with the pain and let it be expressed; cry, punch a pillow or write an angry letter. Each time you allow grief instead of denying it, you are one step closer to healing. While it’s not healthy to suppress grief with false positivity, it is equally important not to deny yourself periods of joy while you are grieving. Sometimes moments of lightness can elicit guilt because, if you can feel happiness, does that mean you didn’t care about the relationship as much as you claimed? Notice when this happens and just reassure yourself that humans are complex and grief is not “all or nothing”. It’s ok for your world to be falling down around you and to enjoy an evening with friends, cry with laughter at a really funny movie or treat yourself to whatever makes you feel good (whether that’s walk on the beach or a an afternoon of self-indulgence). Notice when you are feeling good and keep a mental or written note of it. This is important because when the sadness resurfaces (as it will), you will have a reminder that it is possible to feel happiness despite what is happening in your world. Your mind and mindset are your most powerful tools in turning round any situation. The way you think can either open up opportunities to move forward, or shut them down. If you tell yourself you will never be happy again, it will take either a lot of emotional work or a huge stroke of luck to change that belief. If you can allow yourself to believe that it’s possible for your life to change and commit to working towards that, then you are already on your way to making it happen. Picture your future three, six and twelve months from now – what are your thoughts about your situation and emotions. Are they predominantly fearful or negative? Without denying reality, can you insert some more hopeful or positive beliefs in there? Can you check some of those painful beliefs to assess how true they really are, or whether they might be exaggerated by grief? Need some tips for a more positive mindset? Read inspiring stories – learn from others who have come through hardship of any kind. Practising gratitude! Research shows that appreciating small blessings increases emotional well-being. Difficulty sleeping leads to feeling low – consider trying some gentle yoga or meditation before bed. This can be the hardest of all because our current level of happiness usually depends on our circumstances – if things are awful now, we assume they will always be this way because we can’t see a way out. But having even a small amount of trust and faith that things can get better will set you more quickly on the path to actually making things better. 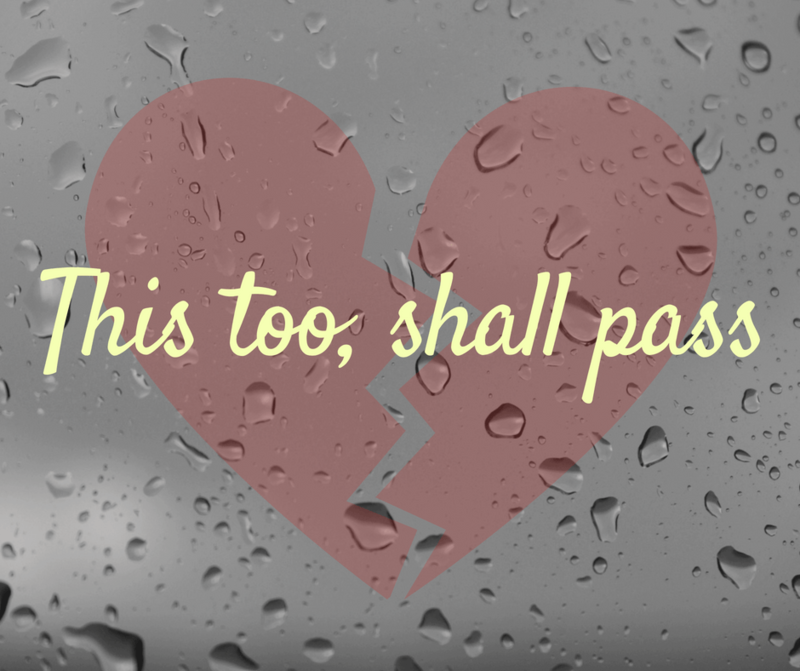 After my husband left, during a particularly low moment, a friend said to me “You know what? In a year from now you’ll be drinking a cocktail and laughing at what a lucky escape you had!” I couldn’t picture that at all, but the thought made me smile and left me with the feeling that there was a possibility somewhere that I could be OK again. And of course, I was. The turnaround will never be instant, because that’s not how grief works, but it will happen; I’ve seen it in people I know, in my work and in my own life. In the beginning, we are so consumed with sadness that each day is a battle. Yet, through a process of expressing the emotions and taking small forward steps to change how we feel, we go from grieving our loss to realising that our happiness was never actually dependent on this sole relationship. Your best life is yet to come.